Had a good walk to Tarn Shelf on Friday. Haven't done this walk for a while. It's really good in autumn when the fagus is out, but it was pleasant enough yesterday. 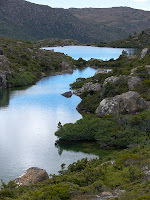 Tarn Shelf is just that - a shelf, crowded with large and small glacial lakes half way up the side of the Rodway Range in the Mt Field National Park. 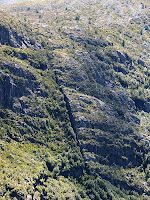 The range falls steeply then flattens out across the shelf, and then falls steeply again to Lake Seal and Lake Webster. The shelf itself ranges between about 100m and several hundred metres wide, and it gradually falls from south to north. 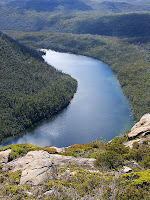 It extends a little over 2 km between the Rodway Hut and ski tow in the south to Lake Newdegate in the north. 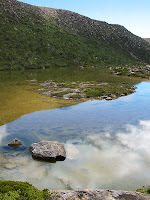 The walk has great views across the eastern section of the park, especially looking very steeply down on Lake Seal. 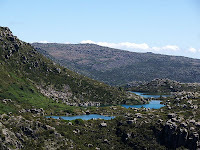 Views also of Lake Webster, Platypus Tarn and the Mt Field East block. The tarns themselves are great for sitting beside. Swimming was tempting in the hot sun, but the water was predictably freezing cold. 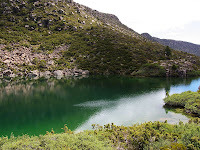 The deep green reflection of the slopes of the Rodway Range in Mackenzie Tarn was striking. Mackenzie Tarn, with Johnston Tarn beyond. 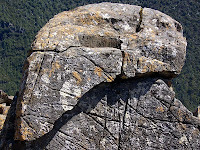 This interesting and scarred rock sits beside a very good lookout along the windy track from the lowest ski lodges out onto the open plateau. This very obvious faultline sits on the steep slope of the saddle between Tarn Shelf and Mt Bridges, and is obvious from the lookout mention just above, as well as from several easy vantage points along the shelf.